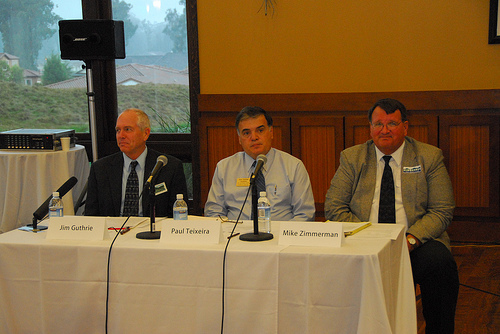 Jim Guthrie, Paul Teixeira, and Mike Zimmerman fielded questions on 22 separate issues over the course of the two-hour forum at the Trilogy Golf Course, sponsored by the Nipomo Incorporation Committee for Education. Teixeira, whose family has lived in Nipomo for more than 40 years, and Zimmerman, an attorney who lives in Huasna, seemed to agree down the line on answers to many questions submitted by the audience. Guthrie, currently on the Arroyo Grande City Council, disagreed on some key issues. Guthrie is opposed to offshore oil drilling; Teixeira and Zimmerman both favor drilling. All three candidates are opposed to medical marijuana dispensaries in their current form. Teixeira and Zimmerman expressed reservations about so-called “smart growth” — Zimmerman called it “dumb growth.” Guthrie defended the policy, citing success in Templeton and Arroyo Grande. Zimmerman and Teixeira believe desalination is a partial solution to the water problem. Guthrie believes desalination “is a ways off” and prefers a regional solution. The primary election is in June. If no candidate receives 50 percent, plus one vote, the top two candidates head into a November runoff. Teixeira had done a terrible job on the school board. Check out his record, wasted money, lawsuits, most of the teachers are unhappy, etc. We have the worst school board that I’ve ever seen. I have been to several board meetings and he adds nothing. We don’t need this guy.